Undergraduate students from five local schools tackled the real world challenge of embracing diversity in business by creating an inclusive workplace as part of a LeBow case competition. The April 29 event was sponsored by TD Bank. The student teams served as management consultants assisting TD Bank in developing strategies to encourage employees to embrace their diversity by self-identifying. 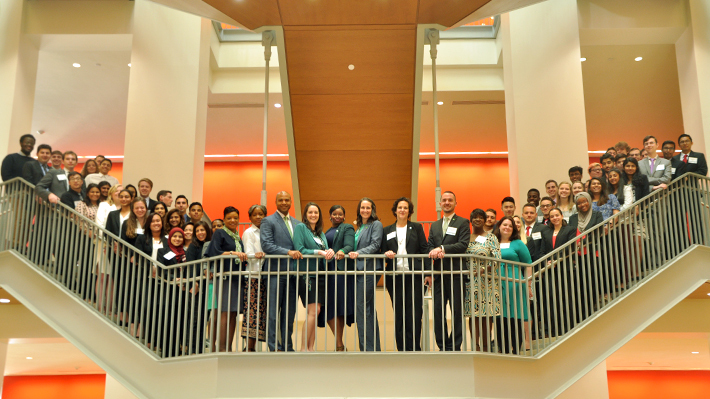 TD Bank executives as well as Drexel faculty and professional staff served as judges for the competition. Fifteen teams competed in the inaugural case study competition, including teams from Drexel, Arcadia University, Rowan University and University of Delaware. Drexel student teams represented LeBow as well as the College of Arts and Sciences, Engineering, Computing & Informatics and Westphal. The final three teams included a team of seniors from Delaware and two from Drexel, one of seniors and one entirely of first year students. The judges had a hard time selecting the final winner as the top two teams both offered novel suggestions for the problem presented. Ultimately Delaware took home the top prize of $2,000 with ideas that could be implemented right away in the company to make a difference. The second place team took home $1,000 for their future-focused initiatives. Third place received $500. The event also included a keynote speech from Kelley Cornish, senior vice president and head of U.S. diversity and inclusion for TD Bank’s human resources. TD Bank was a natural partner for this competition because of their commitment to diversity as they feel it is not just the right thing to do but critical to achieving their mission of being a leading North American bank. Drexel LeBow hopes to host the competition annually for the Philadelphia collegiate community. While other members of the Drexel community were enjoying the break from work and school, LeBow’s BRIDGE students were winning big at the National Diversity Case Competition.